When ever I go to Belize I always make sure that I sample Stew Chicken its the national dish and very very tasty. Served with Rice and Beans some fried Plantain and Slaw blooming lovely. Served in every household all taste slightly different but all are delish so why not try some out. Mix the achiote paste with the vinegar and rub it all over the chicken pieces. Put the pieces in a large bowl and add the Worchestershire, cumin, thyme, oregano and black pepper. Chop the onion, pepper and garlic and set aside. Melt the coconut oil in a large saucepan. When it has melted completely, add the sugar and swirl to distribute. Remove the chicken from the bowl, reserving the marinade, and brown both sides in the oil and sugar mixture. Add the onions, peppers and garlic. Saute until the onions are translucent. Add the reserved marinade and Coconut Milk to the pot and then add enough water to “almost cover” the chicken. Let simmer for 40 minutes to an hour, until the chicken is tender and the juices run clear. Adjust the seasonings if necessary. 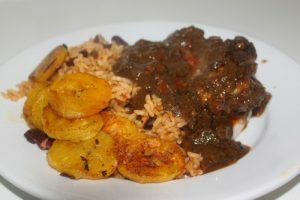 Serve with 1 cup of rice and beans and 3 pieces of Plantain and a spoon of slaw.